Connect your iPhone, iPad, or iPod with Lightning connector to your USB-C or Thunderbolt 3 (USB-C) enabled Mac for syncing and charging. NEW OPEN BOX . Trending at $11.61eBay determines this price through a machine learned model of the product's sale prices within the last 90 days. The Apple Pencil and Lightning cable pictured is not included. The adapter is sealed in the Apple service part envelope. Compatibility: Apple Pencil, iPad Pro, iPad (6th generation). If frees up the Lightning connector on your iPad. The USB Type-C SD Card Reader from Apple features a built-in USB Type-C cable, which is compatible with a variety of notebooks and now, third-generation iPad Pros. USB-C to SD Card Reader (White). It's compatible with UHS-II SD cards and backwards compatible with other SD cards and adapters. 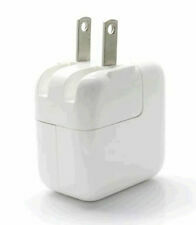 Apple 12W USB Power Adapter Wall Charger A1401 for iPhone, iPad, and iPod NO RETAIL PACKAGING. MINT CONDITION. FREE SHIPPING. Cables are in excellent condition. New Genuine Original OEM APPLE Lightning USB Cable for iPad Pro 12.9" 10.5" 9.7"
IPad Models. iPad (6th Generation). iPad (5th Generation). iPad mini 4. iPad mini 3. iPad mini 2. iPad Air 2. Part number: MD818ZM/A. Due to the high amount of international fraud. Mfg Part No. : A1357. Manufacturer: Apple. The RMA# number that was issued to you should be clearly written on the top of the box and not covered by any labels. Electronic waste contains hazardous materials. We appreciate your response. Any item listed "As Is" or "For Parts Only" are not covered by this limited warranty. Compatible Model: For Apple iPhone X,For Apple iPhone 8, Universal. Type: USB Cable. WHY BUY FROM Spartan Technologies?. 12W Wall Adapter. 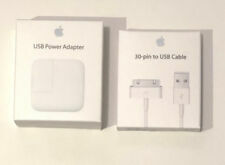 Included: 1-12W Apple Power Adapter Original Apple Box. iPad Models. · iPad (1st generation). · iPad 2 (2nd generation). · iPad (3rd generation). · iPad mini. · iPad Air. Compatible Models: iPhone 3G, 3GS, 4, 4S. iPad 1, 2, 3. iPod Touch 1st, 2nd, 3rd, 4th, 5th Generation. iPod Nano 1st, 2nd, 3rd, 4th, 5th, 6th Generation. iPod Classic 80GB/ 160GB (2007), 120GB (2008), 160GB (2009). IPhone 6s Plus. This USB 2.0 cable connects your iPhone, iPad, or iPod with Lightning connector to your computer’s USB port for syncing and charging. 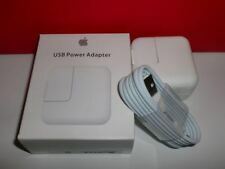 Or you can connect to the Apple USB Power Adapter for convenient charging from a wall outlet. This USB 2.0 cable connects your Apple iPhone 5, iPod Nano 7th Generation, iPod Touch 5th Generation, iPad 4th Generation and iPad Mini devices with Lightning connector to your computer's USB port for syncing and charging. Trending at $7.50eBay determines this price through a machine learned model of the product's sale prices within the last 90 days. IPod Nano 6th Gen. iPod Nano 5th Gen. iPod Nano 4th Gen. iPod Nano 3rd Gen. iPod Nano 2nd Gen. iPod Nano 1st Gen. iPod Touch 4th Gen. iPod Touch 3rd Gen.
Apple has been supplying consumers with electronics and accessories for decades. The company uses special connectors on its iPad charging cords to send power to the battery. 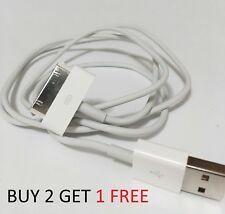 You can use eBay to narrow your search and to find the iPad cable that fits your portable device. What types of iPad charging cables are there? Standard: This is one of the most ubiquitous types of iPad cables you can find. 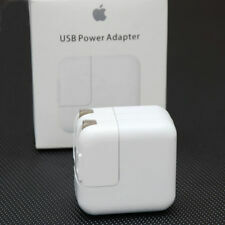 It has an Apple lightning connector at one end for an iPad input socket. You may be able to plug it into the wall or another device. Sync: If you want to do more than just charge your iPad, a sync cable might be what you need. It can sync data between two Apple devices. Wall charger: Standard wall chargers come with an iPad power cord and a unit. Which iPad models are compatible? Apple strives to make iPad charging cords that are compatible with as many of its products as possible. 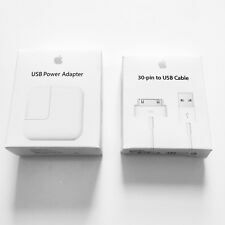 If compatibility is a concern for you, eBay can categorize its selection of iPad charger cables based on which ones will work with the iPad of your choice. You can find working charger cords for several generations of the first iPad, the iPad 2, the iPad Air, the iPad Air 2, and various iPad Minis. Can you get used iPad charging cords? 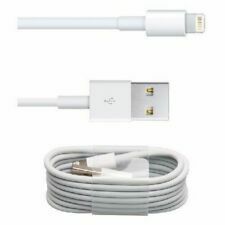 You can purchase brand new iPad cords in their original packaging, but eBay also offers a wide variety of pre-owned cables for sale. 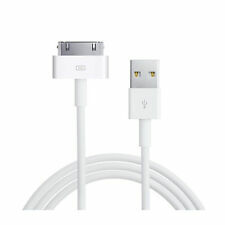 You may wish to buy several used cables in bulk to ensure that you have enough cords to power all your Apple devices. In most cases, used charging cables will work as intended and may feature only slight cosmetic differences than their newer counterparts. How do you charge your iPad in your car? If you want to take your iPad with you during your travels, you can purchase an iPad charger with a car adapter. This item is similar to a wall charger, but it includes a special design that allows it to use your car's power to charge the battery on your iPad.